Gas vs. Wood Fireplace: What’s Right for You? This entry was posted in Fireplaces on January 24, 2019 by The Original Flame Author. Traditional wood fireplaces have been around for ages. Naturally, whenever we think about a fireplace, we feel a strong inclination towards a wood-burning fireplace. Although this style of fireplace means having a room with a chimney, it’s also a room where you can enjoy the warmth and ambiance of a fire with the crackling of burning logs. The traditional definition of a fireplace has undergone a transition since gas fireplaces came into existence. Today, when our customers approach us, they are somewhat confused about which fireplace they should opt for – gas or wood. With many such experiences, we decided to shed some light on both fireplace types, so you can make a more informed decision. Wood-burning fireplaces provide a warm and cozy look and feel to any room, with their hot orange crackling logs and dancing yellow flames. The sound of the crackling of the fire, with the occasional sparks and the smell of the burning wood adds a primal ambiance to the room. This is a primary reason why many people wish to install a wood burning fireplace to transform their living space into something extraordinary! For a wood-burning fireplace, the first obvious requirement is wood. So, you will first have to take into consideration how easily you can arrange firewood. You will also have to take heed to the storage possibilities of the wood. If you live in the city, this might pose a bigger problem for you. However, most people are able to purchase wood at reasonable prices from a local supplier. Some even manage to find some logs for free! When sorted with the wood situation, the next thing you will have to deal with is the maintenance of a wood fireplace. Traditional wood fireplaces require regular maintenance to perform optimally. You need to clean the fireplace after it has cooled down, sweeping up the fine ash. You will also need to schedule proper cleaning and maintenance of the chimney to prevent a buildup of creosote. And the fire code standards have also made it mandatory that these chimneys should be inspected by a professional chimney sweep once a year to prevent fire disasters. Maintaining a wood burning fireplace is a time-consuming task that may require more effort than anticipated. The regular cleaning of ash as well as hauling and storing of wood requires a lot of labour. Apart from this, wood burning fireplaces may also present some serious health and fire hazards that you should be aware of. The creosote can form and deposits inside the chimney which is highly-flammable in nature and can burn at around 2000F. The ash deposited from the burning logs can cause serious allergies and diseases like asthma if breathed in. Though wood burning fireplaces present some downsides in terms of high-maintenance one big advantage of having a wood-burning fireplace is that there is no need to worry about power. A wood burning fireplace can be used around the clock, without having to worry about power outages, fuel levels, and pilot lights. You can light a fire anytime using just a match, kindling, and some wood, creating a warm and cozy ambiance. Now let’s switch gears from wood-fueled fireplaces to gas-fueled fireplaces. A gas fireplace is a unique concept. It represents something that is both practical and beautiful at the same time. The newly introduced natural gas fireplaces are based on a heat-efficient technology. While open wood-burning fireplaces offer only about 10% efficiency and factory-built wood fireplaces offer about 60% efficiency (depending on the manufacturer and installation), gas fireplaces offer closer to 75% efficiency or more. Both fuels that are commonly used in these types of fireplaces – propane and natural gas – are comparatively clean-burning fuels. This ensures that they burn more efficiently. On the grounds of maintenance and installation, gas fireplaces offer significant ease and advantages. Firstly, there is no mess from gathering, cutting and storing wood. Secondly, there is no ash or creosote issue to deal with after the fire is out. Unlike a wood fire, a gas fire doesn’t need to be constantly monitored and fed with logs. You can just sit back and relax once you have ignited the fireplace. Since gas fuels burn cleaner, there is no need for cleaning the venting in a gas fireplace. They can be vented through concentric pipes running through the walls or roof, enabling a fireplace to be installed just about anywhere in the house. This will provide you with innumerable styling options, adding to the aesthetics of your living space. 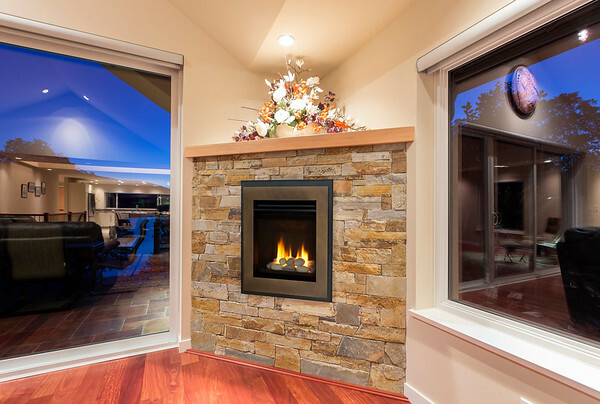 To add to the convenience, a gas fireplace is very easy to light up. You can start a fire with the simple flip of a switch or the push of a button. And if you are worried about power outages, you can opt for a model that supports manual lighting or has a pilot light. Also, as mentioned earlier, you do not need to keep a constant eye on a gas fireplace once it’s been lit. The pros of a gas fireplace present a very alluring picture. However, just like everything else, there are some downsides to a gas fireplace as well. For most people, owning a fireplace is all about the ambiance and the sights and sounds of the crackling fire. A gas fireplace does not offer the same sights, sounds and smells of burning wood like that in a wood fireplace. Again, although you do not need a full chimney, a gas line is required to be set up to transport gas to the fireplace. This may also present the hazard of a gas leak if the line is faulty. To prevent these risks, one should always opt for a professional installation. The final decision thus lands on what your individual specific needs are. If you wish to have a natural fire which smells heavenly and crackles beautifully, a wood fireplace will be your best option. On the contrary, if you are looking to install a fireplace that is efficient and is also easy-to-maintain, you should opt for a gas fireplace. No matter what fireplace you are looking for; always remember to have it installed by a certified technician! At The Original Flame, no matter what fireplace you choose, we are here to serve all your needs.